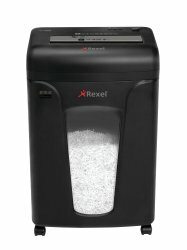 The Rexel REM820 executive Mercury shredder is easy to operate and provides highly confidential security with effective 2x15mm micro cut shredding. Featuring revolutionary Jam Free Technology, this shredder automatically alerts the user when trying to shred too many papers in one go. It is capable of shredding 8 sheets (80gsm) or 9 sheets (70gsm) of A4 paper at a time and features an easy to empty 21 litre pull out bin which takes up to 220 sheets. The machine has full diagnostic controls including automatic Start/Stop and automatic reverse functions. This Mercury shredder can also shred staples, paper clips, credit cards and CD/DVD's (not to DIN standard). It has easy to use controls, backlit control panel and a low noise induction motor for super quiet running. The Rexel REM8200 shredder has a 2 year warranty with 7 years on the cutting head.